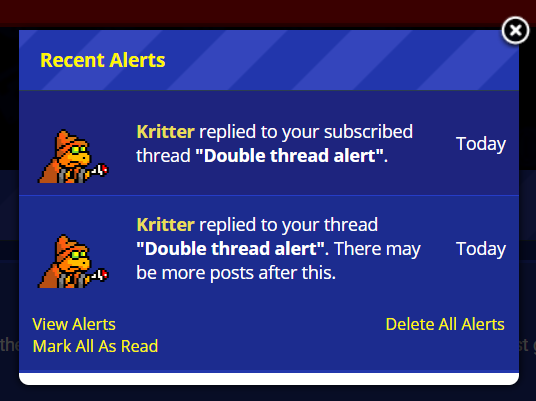 Making a thread and then subscribing to it gives you two different alerts every time a post goes up. Is there any way to fix that? - Receive alert when somebody replies to your thread? - Receive alert when somebody replies to one of your subscribed threads? If the only way to fix that is to untick one of those, I'll do so, I was just wondering if there was a fix for it. To my knowledge there's no way to "fix" it, it's just a quirk. I mean it's literally doing what you're essentially asking it to do, giving you alerts for those two things. Maybe there's a way to wrangle in a fix but I don't have it in me to bother. It is possible to fix this if the core files are modified. 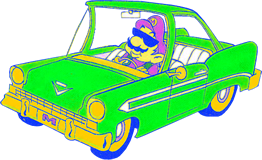 However if the forum software is updated again, it will revert back to the original codes. This is the way the feature is intended to work on myBB. If you don't want to receive multiple alerts, you will have to disable one of them.